Rumex ×borbasii Błocki, a natural hybrid between R. confertus Willd. 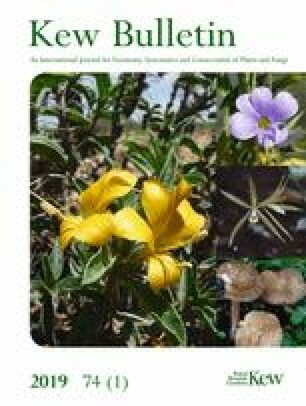 and R. obtusifolius L., and R. ×skofitzii Błocki, a natural hybrid between R. confertus and R. crispus L., are lectotypified based on critical revision of herbarium material deposited in KRA, KRAM, LW and WA, forming part of the collections of Bronisław Błocki. 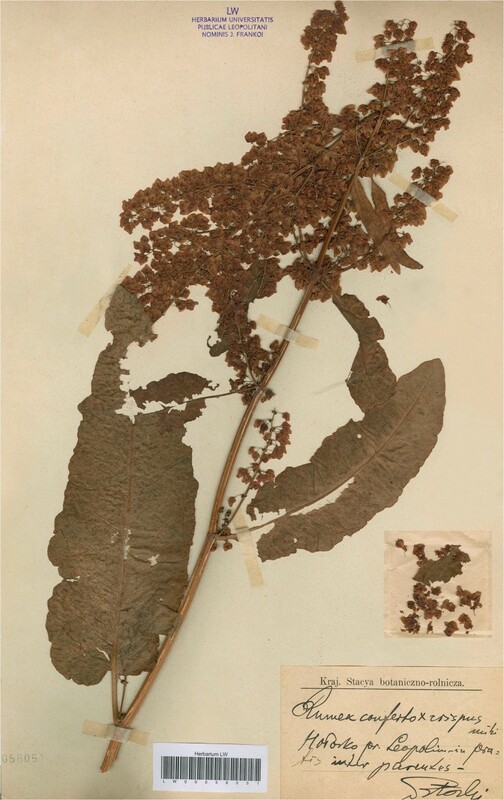 The genus Rumex L. (Polygonaceae) comprises about 200 species distributed worldwide (Mosyakin 2005) and is known as one of the richest genera in natural hybrids, especially within the subgenus Rumex (Rechinger 1984; Daehler & Carino 2001). Moreover, there are also artificial hybrids of economic importance (Hujerová et al. 2013). Rumex ×borbasii Błocki, a natural hybrid between R. confertus Willd. and R. obtusifolius L., and R. ×skofitzii Błocki, a natural hybrid between R. confertus and R. crispus L., were described from western Ukraine by Bronisław Błocki, a Polish botanist, and validly published in the late 19th century (Błocki 1888b, 1889). Both hybrids have been reported from several countries in northern, central and eastern Europe (Stace et al. 2015) and they occur usually with their parent species in anthropogenic habitats (Błocki 1888a, 1888b, 1892; Snogerup 2000; Stace et al. 2015). Rumex ×skofitzii resembles R. confertus in size but has narrower stem leaves with crisped margins and lax panicles with lanceolate crisped bracts. Moreover, the mature tepals possess largely rounded tubercles similar to those of R. crispus and the tepal apex is less rounded than in R. confertus (Stace et al. 2015). Rumex ×borbasii has the wide basal and lower stem leaves similar to those of R. confertus, but they are thinner in texture and the midrib bears some indumentum abaxially resembling R. obtusifolius. The panicle of R. ×borbasii is lax with irregularly maturing tepals, however, the well-developed tepals are tubercled, broad with a subacute apex, and bear shortly toothed margins (Stace et al. 2015). The flowers of R. ×skofitzii and R. ×borbasii are irregular in maturing and appear sterile, however, some individuals of both hybrids produce a low number of seeds (Snogerup 2000; Stace et al. 2015). Interestingly, in countries where R. confertus is considered alien (e.g. Lithuania, Poland, Sweden, UK) its hybrids also should be treated as alien taxa, following the concept proposed by Pyšek et al. (2004), and a proper recognition of spontaneous hybrids between alien R. confertus and its native congeners is important to control their negative impacts. 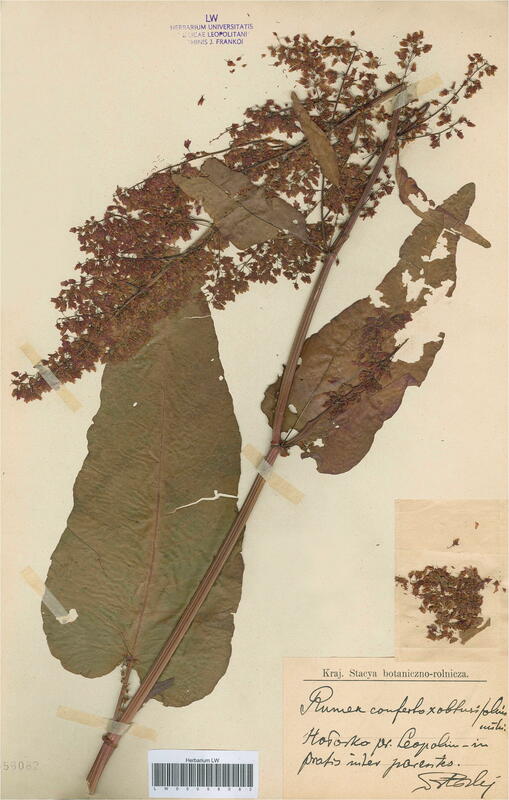 Although the names of Rumex ×skofitzii and R. ×borbasii are adopted by other authors (Snogerup 2000; Stace et al. 2015), they have never been typified. Therefore, after critical revision of the original material, R. ×skofitzii and R. ×borbasii are lectotypified here. Selection and designation of type specimens followed the rules set out in the International Code of Nomenclature for Algae, Fungi, and Plants (Turland et al. 2018). Original herbarium material of Rumex ×skofitzii and R. ×borbasii was critically revised in 2016 based on collections deposited in KRA, KRAM, LW and WA, and compared to data included in the protologues (Błocki 1888b, 1889). In addition, the resources on JSTOR Global Plants (https://plants.jstor.org) and Virtual Herbaria (http://www.herbarium.univie.ac.at) were also checked. Rumex ×borbasii Błocki (1889: 155). Type: Ukraine, Holosko (Lviv), unknown date, B. Błocki s.n. (lectotype LW [LW00058082]!, selected here; isolectotype LW [LW00058081]!). Fig. 1. Lectotype of Rumex ×borbasii (B. Błocki s.n. LW [LW00058082]). notes. Originally, the hybrid involving Rumex confertus and R. obtusifolius was described under the name R. ×kerneri Błocki (Błocki 1888a). However, its name was changed when Błocki (1889) found out that the epithet had already been applied to another Rumex species by Borbás (1884), namely R. kerneri Borbás. The name of R. ×borbasii was given by Błocki in honour of Vincze von Borbás, a Hungarian botanist. In the protologue of R. ×borbasii (Błocki 1888a, 1889), two localities near Lviv (i.e., Zamarstyniv and Holosko Velyke) were mentioned as loci classici. Nowadays, Zamarstyniv is one of the boroughs of the city of Lviv and Holosko Velyke is a suburb of Lviv (western Ukraine). The specimens proposed herein as lectotype and isolectotype were collected in Holosko (short version of the name of Holosko Velyke) and are the most informative original material available and they match Błocki’s protologue. Rumex ×skofitzii Błocki (1888b: 340). Type: Ukraine, Holosko (Lviv), unknown date, B. Błocki s.n. (lectotype LW [LW00058051]!, selected here; isolectotypes LW [LW00058050]!, KRAM [KRAM129323]!). Fig. 2. Lectotype of Rumex ×skofitzii (B. Błocki s.n. LW [LW00058051]). notes. The name of Rumex ×skofitzii was given by Błocki to honour Alexander Skofitz, an Austrian botanist and pharmacist. In the protologue of R. ×skofitzii, Błocki (1888b) did not provide a detailed description of the locus classicus, indicating only that the hybrid was found near Lviv. In the present work, I decided to choose the type specimens collected by Błocki in Holosko, formerly a village situated near Lviv. Morphological characters of specimens selected here as lectotype and isolectotype of R. ×skofitzii are as described in the protologue. I would like to thank the curators of KRA and KRAM for providing access to Bronisław Błocki’s collections and the curators of LW and WA for sending me digitised images of herbarium sheets.